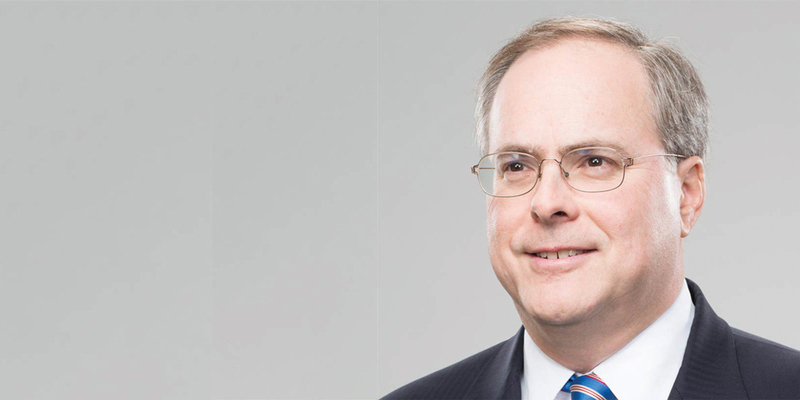 Alan M Klein is a partner at Simpson Thacher and Bartlett LLP, and a member of the firm’s corporate department with extensive experience in mergers and acquisitions, shareholder activism and corporate governance matters. He assisted Microsoft in its US$24.6 billion acquisition of LinkedIn, ChemChina in its US$46.6 billion acquisition of Syngenta, Tyco in its US$27.7 billion merger with Johnson Controls, Inc, and The ADT Corporation in its US$12.3 billion sale to Apollo Group Management. In addition to the LinkedIn transaction, he represented Microsoft on its US$7.2 billion acquisition of Nokia’s phone business, its US$8.5 billion acquisition of Skype and its investment in Barnes & Noble’s Nook business. Other clients have included Tyco International, Best Buy, Chinalco, Gas Natural SA, Portugal Telecom, Gerdau Ameristeel, Bavaria SA and Owens-Illinois. In 2012, The American Lawyer named him a ‘Dealmaker of the Year’. He is a frequent commentator on M&A issues. Klein is co-head of the firm’s mergers and acquisitions practice. GTDT: What trends are you seeing in overall activity levels for mergers and acquisitions in your jurisdiction during the past year or so? Alan M Klein: In the United States, the first three quarters of 2018 have seen an overall slight decline in total deal count from the comparable period in 2017, but this still accounted for the second-highest total on record by both deal value and deal count, totaling US$1.1 trillion and 4,100 transactions. A somewhat deeper look at the dispersion of activity levels over the three quarters of this year shows a more nuanced story. The first quarter of the year was the strongest first quarter of the past five years, coming off an equally strong fourth quarter of 2017. Over US$400 billion of transactions involving a US party were announced in the first quarter of 2018. US deal value in the first quarter of 2018 was 26 per cent higher than that of the first quarter of 2017, and more than double that of the first quarter of 2013. Deal value in the second quarter of this year was almost flat with the first quarter, but that represented an increase of approximately 39 per cent from the second quarter of 2017 and was higher than the similar quarter in 2016. Deal value then slumped in the third quarter this year from the second quarter, but still marking an increase from the third quarter of 2017, which was the lowest level of third quarter activity in the United States since 2012. A fourth quarter with deal value and a number of deals comparable to the roughly US$400 billion and US$500 billion in the fourth quarters of each of 2017 and 2016, respectively, would leave 2018 with a notable increase versus activity in 2017. It remains to be seen how the fourth quarter of 2018 will develop. The fourth quarter of each of 2017 and 2016 both showed significant increases from the prior quarter and was the busiest quarter of that respective year. So the same pattern could hold true for 2018. GTDT: Which sectors have been particularly active or stagnant? What are the underlying reasons for these activity levels? What size are typical transactions? AMK: The single busiest sector in the United States for transactions through the end of the 2018 third quarter was the energy, mining and utilities sector, which set a high of US$268 billion as levels of consolidation continued to rise. Additionally, 2018 gave rise to the sector’s largest deal on record, Energy Transfer Equity’s US$59.6 billion bid for a 97.6 per cent stake in Energy Transfer Partners. The sector appears to be heading toward its highest full-year value on record yet, partly due to the Trump administration’s pro-fossil fuel stance and an increase in commodity prices. Other sectors in the United States are also hitting record values, such as the business services sector due to Cigna’s defensive US$67.9 billion bid for Express Scripts Holding Company and the real estate sector hitting a record US$74.1 billion with its related construction sector also hitting a new record of US$ 25.4 billion. The technology and industrials and chemicals sectors all saw increases in deal value, while the consumer sector saw a significant decrease in deal value from relatively high levels in the immediately prior year. This general pattern of certain sectors being in favour and then cycling out, and of other sectors increasing in activity, has been the case for the past several years in the United States, with energy, mining and utilities being an exception by remaining relatively consistently busy over the past few years. The average transaction size has increased over the comparable period last year to US$271.9 million for the first nine months of 2018, as deal count slightly declined for such period relative to the same period last year. GTDT: What were the recent keynote deals? What made them so significant? AMK: Keynote deals in the United States in 2018 include the horizontal merger between T-Mobile US, Inc and Sprint Corporation for US$60.8 billion – the number three and four wireless carriers, respectively – Cigna Corporation’s defensive US$67.6 billion bid for Express Scripts Holding Company and Energy Transfer Equity LP’s bid for a 97.6 per cent stake in Energy Transfer Partners LP for US$59.6 billion. These transactions are the three largest in the United States in 2018 through September 30. Each transaction is in a different industry, illustrating the range of forms of transactions and sectors that comprise 2018 M&A activity in the United States. GTDT: In your experience, what consideration do shareholders in a target tend to prefer? Are mergers and acquisitions in your jurisdiction primarily cash or share transactions? Are shareholders generally willing to accept shares issued by a foreign acquirer? AMK: In the United States, consideration can be composed of either stock, cash or a combination of both. For a target’s shareholders, obtaining shares as a portion of the consideration allows them to benefit from the synergies resulting from the transaction. Additionally, if a majority of the consideration is comprised of shares, then the receipt of shares may be free of taxes. However, acquisitions by non-US buyers of US public companies are generally entirely for cash. Inversion transactions have been the common exception to the use of all cash when the acquirer is a non-US company. In an inversion transaction, however, the combined business is generally viewed as being controlled by US persons and treated as such by the US Securities and Exchange Commission (SEC), the US stock exchanges and the stock market indices. In such a situation, institutional shareholders in the United States, such as pension funds, foundations and university endowments are permitted to receive the shares of the non-US buyer. In situations where the non-US buyer is truly under non-US control, such shareholders may be reluctant or even not permitted by their investment guidelines to hold shares of non-US entities. Furthermore, under US federal securities law, public company shareholders in the United States may only receive shares as consideration for their existing shares that are issued by a company that is registered with the SEC and that are publicly tradable. This means that a non-US company that is not already a SEC-registrant must go through the steps necessary to become registered prior to the closing of a purchase of a US public company if shares are used as part of its consideration. The time and expense of this process is a limitation on the ability and desire of non-US purchasers to use shares as consideration for purchasing a US public company. GTDT: How has the legal and regulatory landscape for mergers and acquisitions changed during the past few years in your jurisdiction? a recent case in Delaware, the state where a majority of US public companies are incorporated, where the Delaware Chancery Court found for the first time that a buyer was justified in terminating a public company merger agreement due to the occurrence of a ‘Material Adverse Effect’. GTDT: Describe recent developments in the commercial landscape. Are buyers from outside your jurisdiction common? AMK: Buyers from outside the United States are an important part of the US M&A market. However, the amount of inbound activity has declined in 2018 from US$247.8 billion in the first nine months of 2017 to US$199.4 billion for the comparable period in 2018. This is reflective of a general shift in trend as inbound M&A from Canada and China – the two regions considered key bidders for US inbound M&A – fell. Although Canada continued to be a top investor in US companies for the first nine months of 2018, totalling US$49.7 billion, and an increase of 15.5 per cent compared to the same period of 2017, as compared to a total of US$105.6 billion over the same period in 2016, activity dropped 52.9 per cent. The decline being partly due to the uncertainty that surrounded the negotiations of the North American Free Trade Agreement between the United States and Canada. The pattern of Chinese activity similarly followed that of Canada with a decline of 54.7 per cent from the same period of 2017 and a decline of 92.2 per cent from the same period of 2016. Chinese buyers, who had become an important component of the US market, have stepped back from the US market due to increasing restrictions imposed by the Chinese government on acquisitions by Chinese companies and due to the increasing level of scrutiny by US regulators of Chinese buyers. It is safe to assume that the overall decline in non-US buyers coming into the US market reflects the general uncertainty around the political and regulatory climate in the United States rather than concerns regarding the US economy. Through the first nine months of 2018, there has been significant uncertainty around US trade and foreign investment policy, among other things, and this has no doubt deterred some degree of M&A activity in the United States and inbound cross-border M&A activity in particular. GTDT: Are shareholder activists part of the corporate scene? How have they influenced M&A? AMK: Shareholder activism in 2018 continues to be a regular part of the corporate world in both the United States and the rest of the world, with 306 companies being subject to activist demands for board representation, of which 52 per cent were in connection with targets outside the United States. For example, Elliot Management, Paul Singer’s fund, scored a victory after a bitter battle, successfully taking control of two-thirds of the board seats of Telecom Italia, Italy’s biggest phone company. Another major activist campaign of 2018 is a current ongoing battle between Dan Loeb and Third Point Management, on one hand, and Campbell Soup, on the other hand, with Third Point Management having recently increased its stake in the company to nearly 7 per cent and currently in position to attempt to replace the entire board of the company at the shareholder meeting set in November. Shareholder activists are becoming increasingly sophisticated in their approach to board composition, with many proposing high-quality nominees to their slate of board directors. Further, as institutional investors continue to adopt explicit qualifications for diversity in board representation, whether through skill, ethnic or gender diversity, shareholder activists are provided with an opportunity to enhance the quality of a board’s composition through diverse nominee selections using networks not accessible or otherwise not efficiently utilised by companies. One regular aspect of activist campaigns is the urging of companies to put themselves up for sale or to put up for sale portions of their business. This focus on M&A by activists has had an important role in supporting the US M&A market in recent years. In addition to the transactions directly stimulated by activists, many companies have engaged in transactions even before an activist has acquired a stake in that company in order to forestall such an appearance by an activist. GTDT: Take us through the typical stages of a transaction in your jurisdiction. AMK: First contact regarding a possible transaction can either take place between intermediaries or from CEO to CEO. Who makes the initial approach really depends on the particular situation, the nature of the industry and whether there is a pre-existing relationship between executives of the two companies involved. Diligence of non-public information is permissible if a confidentiality agreement is entered into between the parties. Under US law, no disclosure of discussions regarding a possible transaction needs to be made until a definitive agreement with respect to a transaction is executed by the parties, so long as the parties have maintained a position of not making any public comment about a possible transaction while negotiations were taking place. One issue that typically arises at the state of entering into a confidentiality agreement is whether the potential seller will agree to grant to a prospective buyer the exclusive rights to negotiate with that prospective buyer for some period of time. Legally, US sellers have the right to grant a period of exclusive negotiations. However, as a legal matter, the board of directors of a public company being sold must also show that they engaged in an appropriate process intended to obtain the highest price reasonably available for that company. Some kind of check of the market by the prospective seller is necessary in order to truly fulfil that duty. Thus, there is a tension between granting an exclusive right of negotiation and being able to fully assess the market for potential purchasers. Any potential purchaser of a US public company needs to be aware that lawsuits are frequently filed in connection with acquisitions of US public companies. These lawsuits can be filed in the court of state of incorporation of the US company alleging either that the target company’s board of directors has violated their fiduciary duties in connection with agreeing to a sale of the company or can file for a so-called appraisal action, if the shareholder has not voted for the sale of the company at a shareholders meeting in connection with the approval of the transaction or tendered their shares if the form of the transaction is a tender offer. Alternatively, a lawsuit can be filed in a federal court alleging inadequate or misleading disclosure in the documents concerning the transaction that have been filed with the SEC. The majority of US companies are incorporated in the state of Delaware and the Delaware courts have been trying to severely limit the number of suits filed making specious claims that directors have violated their fiduciary duties. The overwhelming number of these suits were simply nuisance suits. Appraisal claims have risen sharply in recent years, but recent Delaware court decisions are similarly trying to curb such suits. GTDT: Are there any legal or commercial changes anticipated in the near future that will materially affect practice or activity in your jurisdiction? AMK: Currently, it is unclear if there will be legal changes that may have a material effect on M&A practice or activity in the United States. As of late October 2018, the Trump administration has continued its aggressive stance towards foreign investment policy in the US by implementing a pilot programme by CFIUS to be effective from November. The focus of this programme is the protection of national security from existing and emerging risks through the expansion and strengthening of CFIUS. Venture capitalists and start-ups are likely to be hit the hardest by the programme, as their unfamiliarity with CFIUS may cause them to be at risk of unintentionally failing to comply with the interim rules. The risks are heightened by a civil monetary fine of up to the value of the transaction. 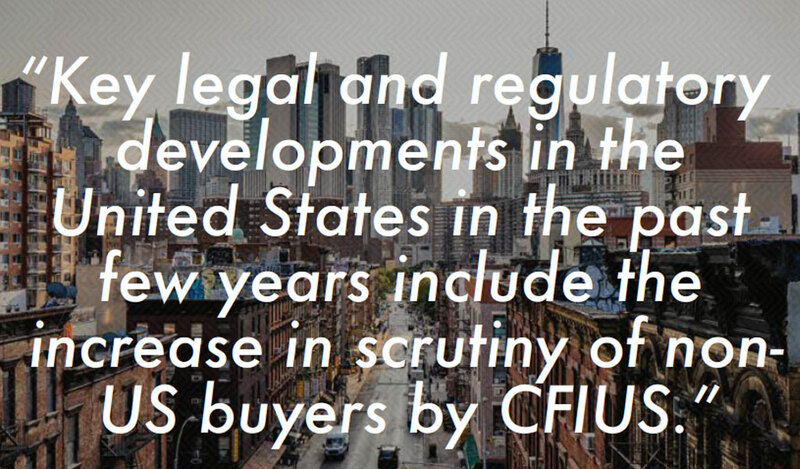 Such unfamiliarity may further lead to regulatory delay and a marked decline in investment from foreign limited partners that would want to avoid the hassles of heightened scrutiny, where the pilot programme will require foreign investors to submit declarations notifying CFIUS of their intentions when making a bid. Under the expanded scope of the pilot programme, non-controlling investments in 27 critical technologies, ranging from semiconductors to aircraft engines, will be subject to national security evaluations provided certain benchmarks are satisfied, including the presence of any involvement in substantive decision-making. Further areas of regulation that may come under significant revision are the regulations with respect to banks and other financial services firms as significant changes are considered to the regulations promulgated under the Dodd-Frank Act, which was enacted following the 2008 financial crisis, and changes to SEC regulations governing public disclosure by US public companies in connection with shareholder votes and takeovers. Both areas of regulation are undergoing substantial review by the current administration, as they are also doing with respect to federal environmental regulation and regulation of telecommunications, approval of new drugs, and health and safety regulation. There is no real certainty as to the timing and scope of any changes that may be implemented, which makes it difficult to assess either the financial impact such changes might have on the valuation of US companies or the changes that might take place in the process or timing of carrying out the acquisition of a US company. GTDT: What does the future hold? What activity levels do you expect for the next year? Which sectors will be the most active? Do you foresee any particular geopolitical or macroeconomic developments that will affect deal sizes and activity? industrials and technology – in large part because of the quickly ramping up convergence between those areas, as industrial companies want to integrate with technology companies and vice versa. To consider what geopolitical or macroeconomic developments could have an effect on M&A activity is to engage in utter speculation. The potential list of developments ranges from threats of nuclear war not seen for the past 25 years, since the end of the Cold War, ongoing and pernicious threats of terrorism, fears about the impact of higher interest rates on the economy and a prolonged US-China trade war, as well as additional natural disasters such as major hurricanes recently hitting the US and massive forest fires in California. Thus, any crystal ball as to future events and their impact remains cloudy. What factors make mergers and acquisitions practice in your jurisdiction unique? The size and complexity of many transactions in the US market, together with the highly developed corporate law governing changes of control of US companies, make the M&A market here unique. Helping boards of directors properly fulfil their fiduciary obligations in connection with a sale of a company is challenging in the litigious environment of the United States. What three things should a client consider when choosing counsel for a complex transaction in your jurisdiction? First, does the counsel listen and communicate well with the client? Second, is there a complete team of specialists and colleagues who work together seamlessly to help the achieve its goals? Third, does the counsel have deep expertise with the kind of transaction under discussion? Successfully guiding complex multinational transactions is not for the novice. What is the most interesting or unusual matter you have recently worked on, and why? I have been fortunate over the past year to have worked on a wide range of transactions that are each examples of the kinds of transformations taking place in a variety of industries. Among them have been such deals an affiliate of Brookfield Asset Management, holder of 30 per cent of GGP Inc, a holding company owning shopping malls across the United States, which was publicly traded on the New York Stock Exchange, acquiring the 70 per cent of GGP which it did not already own for US$15 billion. Shopping malls are confronting the evolution of the retail industry as on-line shopping has taken hold. Negotiating the sale of a public company to a 30 per cent shareholder on behalf of the independent members of the board of directors was filled with complexity.